Several months ago, Georgia Power offered the residents in my condo the chance to switch from their Residential plan to a Residential On Demand plan. I called up Georgia Power to get more information, I was impressed with what I thought our savings would be so I switched over. After three months and getting three bills on this new plan I’m convinced that it’s not all it’s cracked up to be, probably a bad idea for most “normal” homes, and maybe even a bit scam-y. The Residential On Demand plan is a bit more complicated and I initially misunderstood a core detail of the plan. The plan is both usage based and peak demand based. • during “on peak” hours, kWh are billed at 9.6052 ¢/kWh. This last one is where the confusion for me came in. Several examples will best illustrate this charge. If you ran one light bulb that (let’s say) drew 1 kW of electricity, and this bulb stayed on all month, and you didn’t use any other electricity, your On Demand portion would be $6.53 (1 kW X $6.53/kW). If you ran this same light bulb for 30 consecutive minutes once during the month, and didn’t use any other electricity, your On Demand portion would still be $6.53. 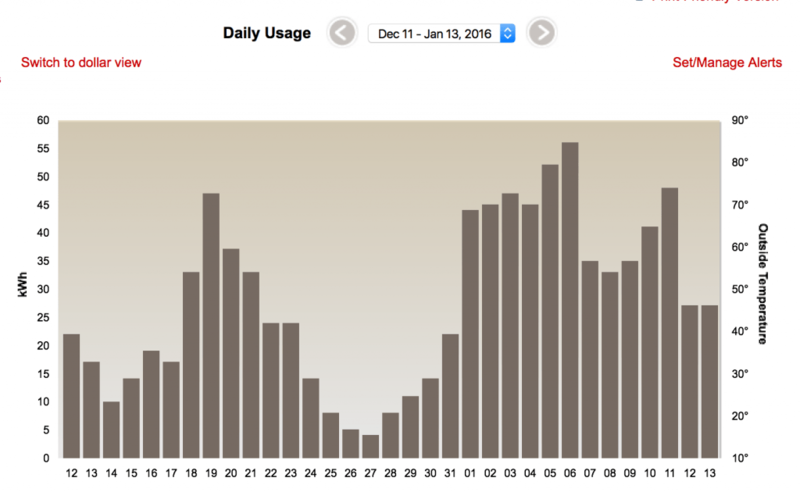 I used substantially less power in December than August but paid more per kWh. That was initially what got me questioning the Residential On Demand plan and my understanding of it. I expected to be paying ~1 ¢/kWh, not 15 ¢/kWh. My first problem, I’ll admit was my own fault when I was reading and asking questions about the plan. I thought the Residential On Demand plan was actually two plans and you picked to be billed at either the “usage” rate or the On Demand rate, not both. This is 100% my mistake and I realized that Georgia Power had not made a mistake when computing my bill. Once I got over feeling so stupid, I started to realized that even knowing this, that the On Demand plan is a bad idea for most people and even maybe a a bit scam-y on Georgia Power’s part. You can see that the On Demand portion of my bill out weights all other portions. The largest way to lower your monthly bill would be to reduce your peak usage, not total usage. Georgia Power suggests not running all your appliances at the same time and putting your HVAC on a timer (this is why the give out a free Nest thermostat if you switch). They also suggest reducing your usage during 2pm – 7pm weekdays, during the summer. This initially makes sense but the more I thought about how I usually think about conservation, the harder it was for me to imagine that I’d actually be able to follow through on this. Growing up I was always taught the general “every little bit helps” idea of saving money. Turn the lights off when you leave the room: save a little. Don’t stand in front of the fridge with the door open: save a little. Run the dishwasher on efficiency cycle: save a little. Every time you don’t do one of these things you lose a little money. But hey, there’s always tomorrow. You can be frugal (or frivolous) and save (or waste) a little more money tomorrow. The problem with the Residential On Demand plan is that none of this thinking is effective. To be effective in lowering the On Demand portion of your bill you have to be diligent all month long. If you aren’t diligent and accidentally run the AC, the dishwasher, the washing machine, and TV all in one 30 minute period your bill will balloon. Once you’ve hit a new peak usage in a month, the only incentive you have is to not exceed that peak later in the month. This diligence becomes a real problem if you have kids, careless roommates or house guests. You could be as careful as possible and the actions of one person for 30 minutes could explode your bill. The problem is further compounded if you, like myself, have an on-demand electric hot water heater. These hot water heaters work by only heating water when it’s needed. They don’t have a tank and don’t store hot water. Under normal electric plans these are incredibly cost efficient. They use bursts of electricity for a short time, instead of using a continuous, but small amount of electricity to keep the tank hot. You can imagine that running the dishwasher or washing machine will draw a lot of electricity at once: some for the on demand water heater, and some for the dishwasher itself. This is a real problem if you are trying to reduce your peak usage. The final problem I see with this plan is the seasonal disparity it will cause. I love having a (nearly) constant electric bill each month. I know that my bill will increase in the summer when I’m more likely to use the AC. However, the Residential On Demand plan will create a huge imbalance between summer and winter bills. In the Residential plan, if you use less than 650 kWh per month, the only increase you see from summer to winter is in the fuel charge. This only amounts to ~1 ¢/kWh increase. Yes you are probably using more electricity but the penalty for being wasteful is nearly the same. This was a bit of a bummer and I called Georgia Power about switching back to the Residential plan. They said that I can only switch once every 12 months and I’d have to wait another 9 months before switching back. I felt like I had to just bite the bullet and deal with my mistake. All of this is still fine and the rules are clear and it’s up to me about how I want to use electricity. What finally upset me and made me demand to be moved back to the Residential plan is in how much data Georgia Power provided about my peak usage. As I was looking more at my online account I discovered something that was not told to me when I switched. However on the Residential On Demand plan I was given zero data about my usage. There’s just a big blank space on the website where the graphs should be. When I asked a customer service rep about this, she informed me that they don’t provide data to Residential On Demand customers! The only data I have is what my peak usage was in the previous month as listed on my bill. I don’t get any information about what day/hours that peak occurred. I have no way to say “Man I used a lot of electricity yesterday at 3pm. I forgot that I used appliances X, Y, and Z. I’ll have to not do that any more.” You could hit a peak on the first day of the month (and not even know it if it was done by your kids, lazy roommate, or visiting in-laws) and then spend the rest of the month being frugal, thinking your are limiting your peak usage and end up with no benefit. You’d never know it! This was finally when I called Georgia Power and demanded to be switched back to the Residential plan. When I explained that the lack of data was unacceptable and not told to me when I switched plans, the representative kindly signed me up for immediate switching. In the end, I had to wait 3-5 business days to have a tech come out and reprogram my meter. I also had to return the Nest thermostat*** to the nearest local Georgia Power office. The Residential On Demand plan is really not worth it for most people. Your bill is so sensitive to your peak usage that you have to be diligent about your usage all month. You are susceptible to a balloon bill if you aren’t careful, or you live with people who aren’t careful either. You aren’t given any information about how well you are doing at reducing your peak usage. **You may notice that this math doesn’t add up. I excluded a ~$1 “Demand side Management fee” that is actually tacked onto my usage and not a line-item along side the other fees and taxes. *** In the end this wasn’t a big deal. I just went out and bought a Nest thermostat. The thing will pay for itself in a year.